A SGM entourage attended the launch of the Kent Excellence in Business Awards (KEiBA Awards) for 2012 last Thursday evening (12th of Jan). It was certainly a well attended event, not least because of the spectacular venue choice being the Shepherd Neame brewery in Faversham, with the compelling attraction of free beer! The KEiBA awards are entering their fourth year, and look set to continue to build on their past success, expanding the awards entries and increasing their profile through out Kent, and the UK. The KEiBA awards are bolstered this year with the addition of new chairman, the affable Geoff Miles, who was the first KEiBA award winner in 2009, and continues to play a significant role in supporting businesses through out Kent. 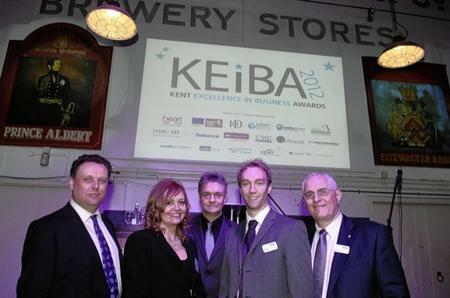 As award winners in 2011, we’re fully supporting both KEiBA and the Kent Foundation this year, and looking forward to perhaps picking up a win at the KEiBA awards gala evening on June 28th 2012. Luke Quilter, the MD of Sleeping Giant Media and winner of KEiBA young entrepreneur of the year 2012 discussed the benefits of entering the awards at the launch evening.